I would like to discuss some details about products or processes. Can I speak to someone? Are Shed City really an Independent manufacturer and have a factory? Yes, Shed City is an Independent steel fabricating company supplying direct to the public. We employ many Australians as we have done for more then 53 years now. there are many more items we also process as part of our diy kits and special orders. You can use your Visa or Mastercard or pay by EFT into our nominated account – details are shown on the CHECK OUT page. Or if it is more convenient, pop into visit us at Kilmore during office hours. What is included a Shed City kit? Our DIY Kit comes complete with the components needed to install/erect the kit. The quantity and types of components vary according to the DIY kit chosen. For example our Shed City exclusive framed shed kits are supplied with all the wall sheets in the chosen profile, the roof sheets in the chosen profile and cut to length; pre-cut and pre-punched C-Sections for the frame, purlins and girts, the spoutings, down pipes, quality flashings and all hardware (e.g. brackets, nuts, bolts, washers, rivets etc), all items are packed and ready for collection or transport direct to your site straight from our factory in Kilmore Victoria. How long will it take for my order to be shipped or available for collection? Product availability depends on the type of product and its source of supply. Many website in-stock items (that at not part of special order or special fabrication) can be prepared for dispatch when payment is cleared funds/processed. Special Order and items requiring manufacturing / prefabricating usually are available/ ready for dispatch within 4-6 weeks of receipt of appropriate cleared payments. Materials/component availability, strikes and other unforseen issues beyond Shed City control can cause variation to the time period however delay in timeframes are not cause for cancellation. Shed City is always open for discussion for faster supply or time frame (faster or slower) to suit our customers. Will you deliver to my place? Yes. We can organise delivery to most places. This includes Victoria, Interstate and overseas. Costs vary and will be added in your order. Most delivery options will become available on our Shopping Cart and you are also always welcome to contact us to discuss your particular delivery requirements. Delivery availability and time will vary depending on your choice of product and your delivery address. For economy, we normally have a shared delivery schedule from our factory where we put multiple customer orders to similar locations together for delivery. Yes – however only for limited products and locations. See WEB Site for delivery options with different products. Costs vary and may be added in your order. Most delivery options will become available on our Shopping Cart and you are also always welcome to contact us to discuss your particular delivery requirements. How do I determine how much delivery will be? If you want to get an idea of the delivery charge – please use the Shoping Cart delivery function on our website or you are welcome to call us on 1300 799 636. Some items have Free delivery however costs vary and may be added in your order. Most delivery options will become available on our Shopping Cart and you are also always welcome to contact us to discuss your particular delivery requirements. What are your normal delivery or collection days and times? Shed City manufactured and supplied products are scheduled into delivery and you are contacted with the scheduled delivery day. Closer to the scheduled day as the final schedule is prepared we may be able to provide a 4 – 6 hour time frame for that weekday. This is to allow to variable factors such as loading and unloading times, traffic on route and other logistics variables. Shed City manufactured items are generally very heavy and bulky in nature and usually delivered via a crane truck, as long as the site is accessible for delivery, you do not need to be present (but you may wish to be.) For economy, we normally have a shared delivery schedule from our factory where we put multiple customer orders to similar locations together for delivery. Collection with a suitable vehicle, of Shed City manufactured products, is available from our factory. Collections can be made during specified times during our standard business hours as well as occasionally on Saturdays or after hours, by appointment. please contact us to discuss. Please refer to the relevant Vicroads transport of good regulations including rear overhang limits for cars and trucks in Victoria bulletin. For items supplied by third party suppliers generally they may contact you with the delivery schedule and / or we can ask them to do so or provide special instructions however the delivery of any third party items is outside Shed City control. Some third party suppliers do provide tracking. If you have concerns Shed City are happy for the items to come into our depot in Kilmore to await your collection or collection by your agent, with an appropriate vehicle. Some items may be supplied to you via Australia post or a courier, generally tracking in available for these items. Can I organise my own delivery or collection from your Factory? Yes. You can organise transport of your products from our factory in Kilmore VIC. Shed City in Kilmore has two road through access for large trucks including B-doubles and loading can be via our on-site fork lift. Collection with a suitable vehicle, of Shed City manufactured products, is available from our factory. Collections can be made during specified times during our standard business hours as well as occasionally, by appointment, on Saturdays or after hours, please contact us to discuss. Please refer to the relevant Vicroads transport of good regulations including rear overhang limits for cars and trucks in Victoria bulletin. Third party supplied items can come into our depot in Kilmore to await your collection or collection by your agent, with an appropriate vehicle. Do you accommodate weekend or special deliveries? Shed City recognises that everybody is different and that our normal arrangement might not suit. Deliveries on a Saturday can occasionally be arranged. Please contact us and advise Shed City Sales Staff of any special requirements for your delivery and we will do our best to accommodate them. Are there any displays available to view? We have displays at Kilmore Industrial Estate, 123 Norther Hwy, Kilmore Victoria 3764. Unlike many others WE ARE NOT solely online store and we do have displays that you can feel, touch, and view to see the quality. We are happy for you for you to check out Our Quality products. In addition we have our experienced Team to provide further information or clarification on a particular product. So please pop in or call our free call number and speak to one of our friendly customer service team who would be more than happy to assist you. Can I get a different size to the ones listed or in the shop? Shed City can provide its manufactured products in a large range of sizes to suit your needs. Each DIY kit is manufactured to order, in our factory in Kilmore, based on design constraints. Many variations are available in size and design and placement of options such as doors, windows and skylights. Shed City has a Standard Colour range and an Extended Colour range. Many of the third party kits supplied have available in a certain colour range. Contact us if the colour you want is not listed in the combinations on our website store. What is the difference between coloured steel and zinc coated products.? Zinc coated steel is a steel strip base with a coating of 45% Zinc and 55% Aluminum. This coating makes the steel more resistant to corrosion. Coated Steel (painted) is pre-painted steel available in a range of colours. It consists of a primed steel base, usually zinc, then coated with paint and finished in the colour chosen on the outer face and coated with paint usually light (shadow) grey finish to the inner face. Note that it is common in Australian to refer to these products as Zincalume and ColorBond – but these refer specifically to trade names that are registered to Bluescope Steel, whether painted / prepared, by Bluescope, in Australia or in one of their many facilities throughout the World. Australian Standard compliant products with zinc or painted coatings are available from other suppliers and it is this compliance and the manufacture process that is important. What do the terms TCT and BMT mean? The thickness of steel coated products may be measured as BMT (Base Metal Thickness), which is entirely structural material. Some suppliers give measurements as TCT (Total Coated Thickness), which includes paint coatings and therefore the same material specification TCT will be larger than BMT. For example: a BMT of 0.42 means the base metal thickness is 0.42 and a TCT of 0.47 usually means the base metal thickness of .42 and then paint coatings of .05 giving the total coated thickness of 0.47, therefore describing the same thickness of base steel. Many competitors use BMT of 0.35 on the roof and walls, whilst others supply BMT of 0.42 on the roof and then 0.35 on the walls. Shed City rollform our own profile sheeting and supply 0.42 BMT for our Roof sheeting and Wall cladding, providing a stronger better quality product. When comparing our Shed City products with competitors make sure that you are comparing “apples” with “apples”. I can not afford a Concrete floor, do I need one? No. Concrete slabs do not contribute to the structural integrity of our Shed City products. Whilst many of our opposition insist on a concrete floor to strengthen their product, Shed City products have been designed around our unique stump system, similar to commercial buildings, whereby stumps are embedded into a concrete footing making a concrete floor unnecessary. You can then choose to have gravel, dirt, pavers, timber or any other type of flooring, alternatively you can lay the concrete slab later. Shed City products do require anchoring as do the third party supplied outbuilding kits we offer. Do I need concrete footings? The majority of the larger Garden Sheds, Carports, Garages and Farm/Machinery Sheds need footings or have a stump/post that is embedded into a footing in order to comply with the structural engineering requirements for the product. Generally though a concrete floor is not necessary and you then have a choice of economical or other flooring. Remember these are buildings and as such need appropriate anchoring. Some of the third party products have alternate ways of anchoring or are supplied with floors that the product is anchored down to. Please check out our website or contact us to discuss your requirements. Can I install unit onto an existing concrete slab? The majority of the larger Garden Sheds, Carports, Garages and Farm/Machinery Sheds need footings or have a stump/post that is embedded into a footing in order to comply with the structural engineering requirements for the product. Generally the concrete will be required to be cut and the appropriate footing prepared and inspected. Remember these are buildings and as such need appropriate anchoring. Some light weight and some of the third party products have alternate ways of anchoring or are supplied with floors that the product is anchored down to so your existing slab may be ok. It is best to check with the relevant qualified person. Existing concrete slabs vary in their integrity generally the best alternative is to cut the concrete or buy a slightly larger product that goes over the top of the slab and can be anchored in outside the edges with appropriate footings. Do your products comply with Australian Standards? Yes. Shed City manufactured products comply with and/or exceed all relevant Australian Standards. These include the standards for design and for materials. Do Shed City provide Engineering Certification? Engineering certification is available for products requiring relevant permits. Shed City superior quality products meet and / or exceed the relevant Australian Standards for design and strength including regional wind loads and other environmental factors. Can I have the window or door in a different place? Yes. Shed City manufactured designs are structurally capable of having windows and/or doors where you want or need them and not only in certain locations as others do. Please talk to our Sales Staff to detail your requirements. Depending on your requirements, an additional charges may apply. Can I have different sized windows or doors? Yes. There is a wide variety of window and door sizes and types available. Please talk to our Sales team about details of your specific door and window size requirements. Can you supply an automatic roller door opener? Yes. There are many models available from budget models through to industrial with pe beams. Do the kits come with downpipes and spoutings? Many of Shed City manufactured DIY kits include spoutings and downpipes. The DIY kits, such as small garden sheds, that do not include spouting and downpipe as standard, can be upgraded to include it and are structurally capable of supporting them. The third party supplied sheds are generally not available with spouting and downpipe. What types of wall sheets do you supply? Within our Shed City factory in Kilmore we machine roll form our own unique designs of wall cladding which are supplied with our DIY kits as well as cut to length direct to the public. Our unique designs available are Ezy Panel (similar to K panel), 5 Rib (similar to trimdek), 4 Rib (robust high rib cladding) and Custom orb Corrugated profiles as well as our Steel Weathboards. What types of roof sheets do you supply? Within our Shed City factory in Kilmore we machine roll form our own unique designs of roof sheeting which are supplied with our DIY kits as well as cut to length direct to the public. Our unique designs available are 5 Rib (similar to trimdek), 4 Rib (robust high rib cladding) and Custom orb Corrugated profiles. Can I have different coloured walls and roof? Within our Shed City factory in Kilmore we machine roll form our own unique designs of roof sheeting and wall cladding for your DIY kits as well as cut to length direct to the public. Therefore, Yes, you can choose from our extensive colour range and the roof sheeting can be one (or more colours if you want a striped effect) and the wall cladding can be a different colour, of course either or both can also be Zinc. Many of the third party kits supplied are also available in colour combinations as well. Can have different colour Flashings and Trims? Within our Shed City factory in Kilmore we manufacture the flashings, trims, spouting and downpipe for your DIY kit as well as fold / process for sale direct to the public. Therefore, Yes, you can choose from our extensive colour range and these components can either match or contrast the rest of your diy kit and of course can also be Zinc. Many of the third party kits supplied are also available in colour combinations for roof, wall, door & window trims however flashings are usually one colour or zinc. Can I insulate my shed or garage? Shed City have available a huge range of insulation to help make your kit cool in summer, warmer in winter and to reduce condensation. Choose from the range at CSR Bradfords and Fletchers Insulation; products such as sisalation/sisaltuff, anticon or polyair. Commercial grade safety mesh is readily available to complement your insulation. Can I extend my product in length later or add an awning or a verandah later? Yes, many of Shed City manufactured kits can easily be extended. Please discuss with our Sales team at the time of ordering to determine if any special brackets need to be added to your order. Can the Shed City team assist in the Permit Process? Yes we can assist you through the process of obtaining your relevant permits. You, the Customer, are responsible for obtaining any permits and the payment of all / any associated fees as well as complying with all regulations. 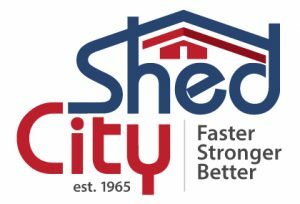 Shed City sales staff have been assisting customers compile and submit Planning and Building Permits for many years and are familiar with most requirements of many local councils and authorities. Shed City recommend that in the first instance – owners should contact their local council / authority to determine what permits maybe required. Within the state of Victoria an outbuilding that is greater then 10 square metres of any shape (eg: 3m x 3.33m or 2.8m x 3.57m or 2m x 5m) requires approval from your local authority. Building permits can be obtained from an independent building surveyor or where available through your local council. Planning permits where necessary can be obtained through the Planning department of your local council. Build over easement permits are through the relevant authority and on some occasions also require approval through your local council as well. Occasionally developers and other bodies within your estate may also require approval. How close to my boundary can I build? Within the state of Victoria an outbuilding is generally allowed to be located 200mm or 1000mm from a boundary subject to the height of the outbuilding and the structure. Naturally a tall structure needs to be further away from a boundary so it is not encroaching on your neighbor, however this can be discussed with your neighbor and the local authority. Special consideration can be taken into account upon application to your local authority. Our friendly staff at Shed City can usually assist you with the requirements you need to take into consideration and the questions you need to ask your local authority. What happens if I have an easement? Easements are a fact of life – particularly in urban areas. Depending on the easement, your location requirements, the size of the unit you wish to have installed, obtaining permission to go over an easement can be relatively straight forward. Some types of easements and sizes of sheds can be problematic. Please talk to our friendly Sales Staff to determine the best way forward with your application. Who can install my shed or product? Yes, majority of Shed City products are designed for DIY so that, you the owner, can install the product yourself. If you feel you don’t have the specific skills – you can engage / co-ordinate the erection/installation using sub-contractors or you will need to engage someone with the appropriate building accreditation (a Builder or Building Practitioner). For large buildings and in some circumstances you will be required to register with your state building commission as an Owner Builder, if you do not engage a registered builder. Note that requirements for Owner Builders vary from state to state. Shed City is an independent manufacturer, supply top quality kits at competitive prices. As hard as we work to keep manufacturing here in Victoria Australia, our wonderful team just can not do it all, so no, Shed City does not organise or take responsibility for any on-site works. Shed City keeps records of builders surveyors, installers, builders, concreters, excavation contractors and others that some of our other customers have used and these can happy be shared upon ordering from us.